We want to thank Andrea Rocca for publishing this revealing review of the LCT 540 S on Gearslutz, inclusive great acoustic guitar, vocal, voiceover and dulcimer sound samples. When I received the LEWITT LCT 540 S I wrote on my website that if this microphone would be tortured by Torquemada his hooded henchmen would not extract a whisper of self-noise from it. I think that what I meant to say is that the LCT 540 S is a very, very quiet microphone. It’s predecessor, the LCT 550, had a record breaking noise floor approaching theoretical zero, and just a bit more than that in real world performance. For engineering this one LEWITT had to build a bespoke measurement instrument, so some may be excused for thinking that in many real life recording scenarios, this would be a case of audio engineering having a baby with metaphysics - but after using it for a while I reached the conclusion that having all that low noise capability on tap is a benefit even when you are not completely aware of it. You might not use it all in a given situation, but it’s there and it makes sure that you have a safety net that will allow you, for instance, to use plenty of compression when mixing without nasty surprises. My two LCT 550's, have become my to go condensers for instrumental and foley recording - like all of the upper end LEWITTs I have tried, they have that elusive combination of neutrality and slightly larger than life rendering, and are, of course, spookily quiet. The LCT 540 S is all that – just a bit more of everything. The “S” in the name originally stood for “Subzero”, a moniker that had to eventually be withdrawn because of copyright issues. I didn’t carry out any scientific comparisons on how the LCT 540 S compares to the 550. Judging by ear, I would say that they sound very similar, with the LCT 540 S sounding perhaps a tiny bit “bigger”, but we’re talking minutiae. All the qualities of the LEWITT upper end family are there: a lovely crispness that doesn’t become shrill even with difficult instruments like strings or the Appalachian dulcimer I recorded for these examples, that subtly larger than life, tridimensional quality they impact on the source and the ability to capture a lot of detail whilst still sounding musical rather than clinical. As for the low noise, it’s hard to tell how much quieter the LCT 540 S is in respect of the 550, so I’ll leave that to people with the necessary instruments and a so inclined mind. I’ll just say that with both of these microphones I’ve been able to do creative recordings that would have been impossible before they had entered my studio life. It’s almost pointless to say that in order to make use of this low noise capability you will need a high-quality preamp with plenty of clean gain, otherwise the preamp’s noise floor will completely undo the work of the microphone. Of what I have here what worked best at high gain levels are the preamps from the Metric Halo ULN-8 and the Millennia HV-3C. Other pres work well for “normal” duties, indeed the LCT 540 S neutral character tends to project the voice of the preamp more than other microphones, but cranking them way over their comfort zones invariably ended up drowning the source in a sea of white noise, made even worse by any compression applied in post. 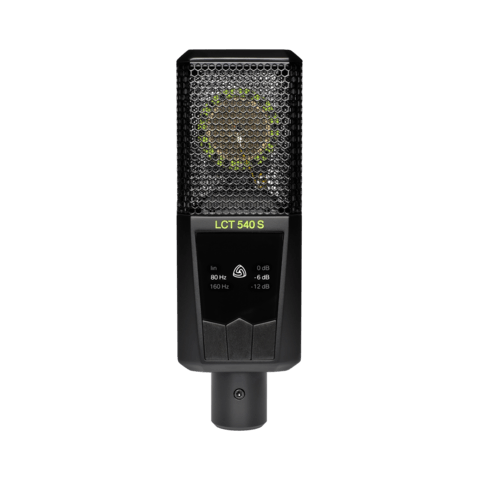 The LCT 540 S is a cardioid microphone, with low cut filters at 160 and 80Hz, two pad choices (-6 and -12 db), some LEWITT only features like the possibility of engaging an automatic attenuation system, an integrated clipping indicator and even a clipping history mode. Like the other family members, it's super solid. It comes in a military grade case with a semi-circular suspended mount, a soft padded pouch and a portable double mesh magnetic popper stopper that, unlike others, actually works. All LCT 540 S are checked at the factory to make sure that they are within the specified tolerances, which means that if you buy two they will be matched paired without having to pay extra. At the beginning of the year, I was hired to score and record the soundtrack for Luigi Lo Cascio’s adaptation of Christopher Marlowe’s Tamburlaine, which debuted at Palermo’s Teatro Stabile in February and will be touring Italy next year. Because time was very tight with this particular project we agreed that the score would be mostly electronic, so that changes could be made during rehearsals in Palermo without me having to re-book musicians and fly back to London to record again. However, it’s always good, with in-the-box scores, to add some extra layers of reality ear candy, so I used the LCT 540 S to record some atmospheric sounds for layering over the samples and synths based cues. One trick that I used before for theatre and contemporary dance scores is to record the sound of an unamplified stylus on a vinyl record (for which I used my pair of Lewitt LCT 550s very successfully in the past). This works well when further messed up with reverbs and delays to provide a background of otherworldly oddness. One of the cues required underlining some transitions in time with the ticking of a metronome, which sounded objectively a bit plain both as an idea and in practice, so I added an extra effect by dragging a bolt attached to a thread over a stripe of coarse sand paper and drenching the resulting sound in reverb: a sound that was barely audible before recording became a huge aural ocean. When I turned the Metric Halo ULN-8’s preamp up to record this, despite my supposedly well sound proofed instrumental booth I could hear noises from the car park behind my garden, a good fifty meters away, together with bird songs, home appliances hums and what was possibly the passionate cry of some lascivious bugs enjoying a moment of extasy. This audio voyeurism conjured up images of Harry Caul, the central character of Francis Ford Coppola’s The Conversation, a film that should be required viewing for all audio voyeurs. 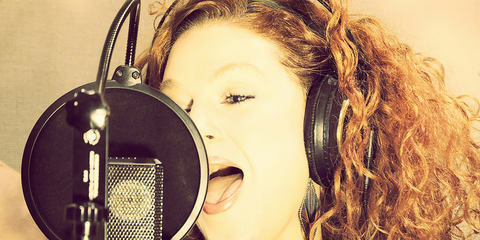 I also had a chance to try the LCT 540 S on spoken vocals. The voice overs had been recorded in another studio in Rome, but I ended up having to redo one since the text had undergone some last minute changes. This was a piece of guerrilla tracking, done in a small changing room, which ar invariably very boxy and reflective since they tend to be full of mirrors. With coats hanging behind the actor and a few cushions placed between his head and the mirror in front of him, I tried to tame it as much as possible. Vincenzo Pirrotta is one of the top actors of Italian theatre. He has a very warm voice, with harmonics galore throughout the register and a crazy range. The LCT 540 S captured it very beautifully, with both the low chest resonance and the sparkly upper end perfectly in focus. I normally add a bit of compression when tracking speech but I got worried that it might emphasize the room reflections so I just kept the level slightly lower than normal. Here’s an extract of the finished take, mixed with the background music and effects. When finally back in my little studio boudoir, in order not to bore you with samples of crackling vinyl and slithering fastenery, I gave a call to my extremely talented friend Sheila Durkin who is recording, in bits and pieces, an album of her songs at my place. I asked her if she was up to doing a track using the LCT 540 S for everything, together with über multi-instrumentalist Johnny Be, who would add some overdubs with his Appalachian dulcimer. Sheila’s guitar is an old nylon string contraption that is definitely not a breeze to record, but she is used to it and as many players, she feels uneasy on a new instrument. It sounds very low-mid centric and can easily end up coming out muddy or even boomy. In the past, I've recorded it with a pair of Audio Technica ATM450s, which worked ok as they don’t have a whole lot of bass, but I always had to put some eq on them for clarity and to unlock the congested mid frequencies. 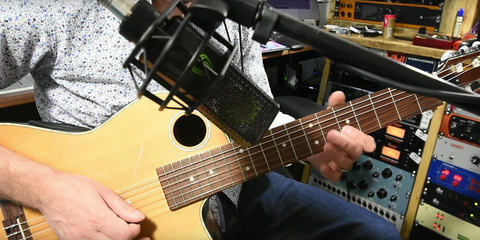 Moving the LCT 540 S around on headphones whilst she was playing I pointed it a few centimeters more towards the neck (rather than the sound hole) than I normally would and I engaged the 160 Hz filter. Suddenly, it sounded just right, so this is how it was recorded – and how it stayed in the mix. Mic filters can sound quite crude and I wouldn’t normally use such a steep one on the way in – I’d rather use a sweeter filter to get rid of low frequencies when mixing, as it’s easy enough to remove them but much harder to put them back should you change your mind. Anyway, I trusted my ears on this one and it worked off the bat, as you can hear. I was also really impressed by the mic’s really great transient response. As we recorded with one mic, I asked Sheila to do the guitar track separately whilst humming the melody to keep track of where she was. You can hear some gentle humming in the guitar part but it adds character to the whole. Using the LCT 540 S for sung vocals was a revelation, Sheila has a husky voice and I thought this LEWITT might sound analytic rather than warm but it proved me wrong by capturing a glorious take that left everyone elated. There’s everything: detail, weight, dynamics. The only undesirable guests were a few mouth artifacts, an inevitable side effect of such a precise microphone, but easy enough to get rid of. Unlike Sheila’s guitar, the Appalachian dulcimer is a lovely instrument, but with a lot of treble resonances that can become harsh at times, so I normally use one or two ribbons on it. I placed the LCT 540 S further away from it than normal (about one meter), and the recording came out really smooth and perfectly balanced. Here is the mix of the whole song (© Sheila Durkin 2018). There’s a bit of buss compression (UAD Neve 33609, which is great for this kind of track) and the vocal and guitar are treated with the Ocean Way Studios room reverb and EP-34 tape echo. The vocals have a UAD LA-2A Silver to ride the peaks and the dulcimer goes through some UAD Space Echo, old tape crinkles and all. At around 650 Euros the LCT 540 S is not cheap, but it can easily be seen as a high-end microphone with a mid-price tag – so in that sense, it’s not expensive either. Even disregarding the almost preternatural low noise performance it’s a great microphone that you should be able to use on just about anything. It is fabulous on instruments and vocals, and the excellent transient response would also make it a very good microphone for percussion. Those looking for a first “serious” studio mic might also consider some arguably more versatile alternatives, for example, the pretty fantastic LCT 640 TS, which is not as quiet but sounds very similar and has multiple polar patterns that you can even change in postproduction, stereo capability and more. 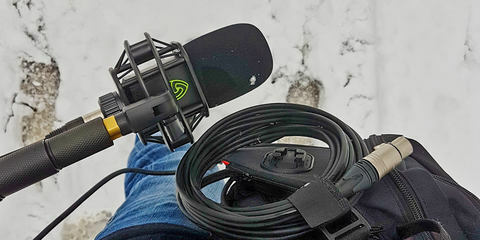 However, if you often record quiet sources, foley, or acoustic instruments that benefit being tracked from a distance and want something among the very best available for that application, it’s a simple choice. About the Author: Andrea Rocca is a composer who is specialized in film and contemporary dance theatre music. From 2004 to 2010 he composed extensively for UK television, with works for Channel4, BBC1, BBC2 and Channel 5. In 2010 he scored Luigi Lo Cascio’s award-winning theatre production La Caccia and the contemporary dance production Frames for Toronto based company Zata Omm Dance Projects. To date, his feature film work includes the British feature The Hurting, Francesco Martinotti’s Branchie, Marco Risi’s L’Ultimo Capodanno and Tre Mogli, and Gianluca Tavarelli’s Liberi (Break Free), which run at the 2003 Venice Film Festival. His score for Luigi Lo Cascio’s La Città Ideale (The Ideal City), which was premiered at the 69th Venice International Film Festival – where it won the Arca Cinema award received widespread critical acclaim. My name is Daniel Meuser and I’m a fully qualified audio engineer and sound designer from Mainz, Germany. I’m specialized in interactive audio, sound design for games, and field recording. The last project I was involved in was “Crytek’s Hunt: The Showdown”, which will be released as an early-access title somewhere around the first quarter of 2018. 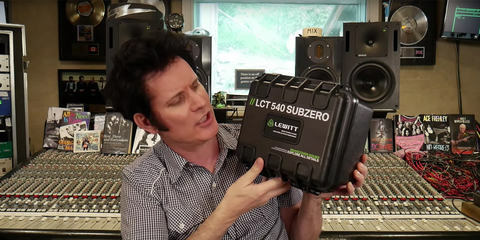 In this video review, Pro Tools Expert Technical Editor James Ivey takes a look at the LCT 540 S and shows you some of the key features of the mic. Then he lets you hear how it sounds on drum overheads and nylon as well as steel string acoustic guitars in a short demo track. These days, product reviews in forums, on shopping sites, and in magazines can help to find out more details about the desired product. 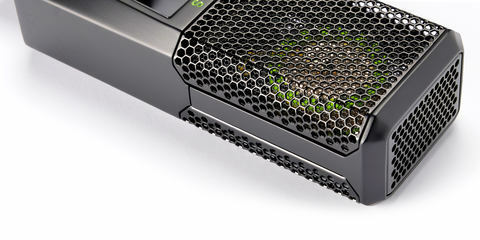 So, to make it easier for you to get an overview of these reviews, we did a little roundup on the LCT 540 S. Happy reading!